In order to sustain their flocks, all farmers need to know how to breed their animals and best practices to prevent health issues. 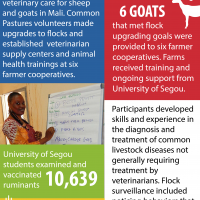 The third set of assignments focused on making upgrades to flock genetics, establishing veterinary supply centers, and educating farmers on diagnosis and treatment of common livestock diseases. Additionally, farmers and Agro-pastoral technical school students received training on marketing and farm management practices. This is the last infographic in a four-part series that educates the public on our work with the Farmer-to-Farmer Program in Mali.